Jude adopted 12/16/04. 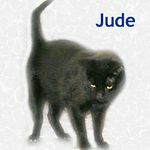 Jude is a friendly yet independent neutered male. He has a very elegant look, whether he is lounging on your favorite chair or a sunny spot on the porch.